When your kids leave the nest, will you have taught them important money lessons, like how to make sound financial decisions and keep their credit score clean? Whether or not you’ve taught your middle schooler basic money lessons, high schoolers can handle increasingly complex financial ideas and practice making more substantial financial decisions for themselves. So before they move out, here are 8 money lessons to teach high schoolers. 1. Credit cards are borrowed money. Use a sample credit card statement to show how fast a month’s worth of “small” purchases adds up, and how interest is applied. Have them calculate the total cost they will pay for an item if they pay only the minimum each month, over the life of an item. 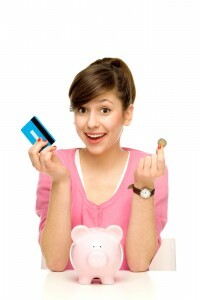 Beware that your credit habits will serve as an example of how it should be used! 2. Loans aren’t all bad… or all good. Talk about the kind of loans available along the spectrum: mortgage loans, lines of credit, car loans, small business loans, and on down to payday loans. Nora Dunn at WiseBread has written a primer on various types of loans and About.com has a brief piece on how cash payday loans work and why they are usually a bad idea. While I’m generally a proponent of having your kids earn their own money prior to making a purchase, setting up a manageable-sized, structured, signed loan agreement with your child for a desired large purchase (such as a fancy pair of shoes, or phone) can teach them about payments, interest, collateral, and yes, repossession in the case of default! 3. Compound interest is your friend. Teenagers are developing the math skills to understand the power of interest-on-interest over time. Use an online compound interest calculator to show them a few examples of how early investments can grow exponentially due to the magic of compounding. 4. Give them an advanced budget challenge. Once they’ve mastered small tasks like budgeting a meal, have your teen graduate to work with you on larger family budget items, such as a vacation. Give them a total available to spend, and what items need to fit into the budget (gas, food, hotel, souvenirs, attractions, etc) and have them practice making trade-offs to come in under budget, such as a cheaper hotel in order to fit in an extra day at Disneyland. Other ideas include a season’s worth of family activities, a month’s grocery budget, or furnishing a room. For younger teens in particular, you may want to involve them but retain veto power. 5. Practice tracking expenses. Have your teen use an Excel spreadsheet or an account on Mint to track every penny they spend for one, three, or six months. If they use Mint (or another electronic/online budgeting program), they can easily generate colorful graphs to more easily visualize where they spend their money. Have them think about which spending they approve of and which categories they may have room to rein in if saving for a big purchase. 7. Taxes, taxes, taxes. Have your teen review your annual tax return (or a sample online). Or better yet, have them sit down with you and walk through preparing your taxes step-by-step if you use a tax program. If your teen has a job and pays taxes, walk them through doing their own taxes now, while they are likely straightforward. Show them their overall effective tax rate and discuss the meaning of marginal tax brackets. 8. Cost of college. If your teen is considering any form of higher education, help them find the cost of various college options (public vs. private vs. community college vs. trade school). Have them research sources of financial aid, and set up a basic sample “post-college” budget to explore how long they may be paying off student loans in various chosen fields. Your teen’s high school guidance counselors should be able to assist you with this topic. 9. Total life budget. By their senior year of high school, help your kid put together a budget for their first year of living on their own and help them identify — realistically! — where the money will come from. Have them research the earning potential of likely jobs they will be able to get as older teens, based on their interests, abilities, and work history. Make sure to include housing, food, auto spending, clothing, insurance, medical needs, fun money, and an emergency fund. Stay tuned for the next installment, when we’ll discuss the pros and cons of your teen having their own credit (or debit) card! You can also read our earlier post about teaching younger kids about money (middle schoolers). How do you talk to your kid about money?